I’m Nearly 1/3rd Done With My Year-Long #40years40races Challenge! | Keep It Up, David! I’m doing stair races and running races, and I’ve done so many races in the past few months that I’m starting to lose count. I need to organize my notes and update my tally. So I’m going to list every race I’ve done this year, in chronological order. There’s a couple that I never talked about, so I’m going to fill in some blanks along the way. Oh, and I’d like to set PRs this year in the 5K and 10K distances. Haven’t done it yet, but workin’ on it! My current 5K PR is 29:15, from the Derby Day race in 2018. My current 10K PR is 59:06, from my very first running race ever, back in 2011. 1) Dallas Vert Mile. 1/13/19, Dallas, Texas. Stair race, 550 stories. Read more here. 2) Winter Fun 10K. 1/20/19, Long Beach, CA. Time: 1:06:39. Read more here. 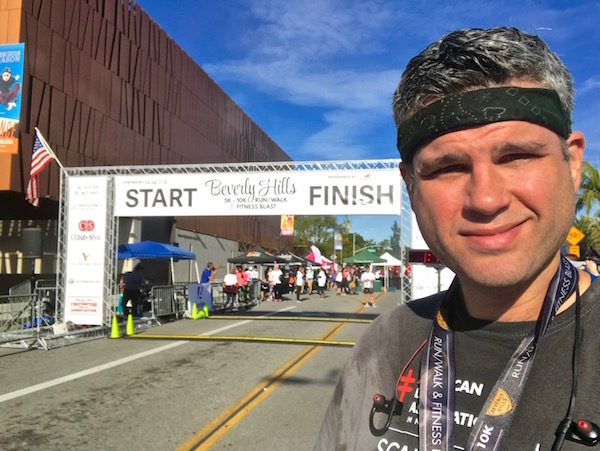 3) Beverly Hills 10K & Fitness Blast. 1/27/19, Beverly Hills, CA. Time: 1:04:02. Read more here. 4) Surf City 5K. 2/3/19, Huntington Beach, CA. Time: 30:24. Read more here. 7) Scale the Strat. 2/24/19, Las Vegas, NV. Stair race, 108 stories. Time: 14:42. Read more here. 8) OutClimb Cancer Challenge. 3/2/19, Salt Lake City, UT. Stair race, 6 hours, 1.9 vertical miles. Read more here. 9) The Enormous Elephant Run 5K. 3/9/19, Los Angeles, CA. Time: 33:47. This race benefited an elephant conservation organization. JJ is at our feet, I swear! Despite having ample time before the race to do his business, JJ decided the best time to poop was in the first quarter-mile of the race. When you gotta go, you gotta go! (And yes, I picked it up!) Between the run and the poop, JJ was exhausted afterward! This race was a giant mess. It benefited the Michael J. Fox Foundation for Parkinson’s Research, which is a worthwhile cause, but I’ll never do this race again. Basically, there were volunteers at a turn on the course that were supposed to tell racers to turn left, and they didn’t. So almost the entire crowd of six hundred runners continued straight, running off-course. I’m certain many, of not most, got lost, confused, or disoriented. I caught the mistake relatively quickly, as it was the same course that I ran during the Enormous Elephant Run and the Miles of Music race, and got myself back on-course. At the next water station, I reported the problem and urged the volunteers to call race organizers so they could do something. When I crossed the finish line, I immediately told another volunteer. I didn’t see anyone jump into action, and that pissed me off. My time of 33:07 was the 7th fastest, out of 610 participants, which is my highest ranking ever. But it doesn’t mean anything, as people ran all sorts of different distances, and not on the predetermined course. Oh, and JJ ran with me! His third 5K race! 11) Sunrise Marathon (5K). 3/23/19, Novato, CA. Time: 33:18. (Another race where, because it was poorly marked, I ran 3.25 miles instead of 3.1.) Read more here. 12) Fehringer Ranch Race (3 miles). 3/31/19, Morrison, CO. Time: 30:19. I ran with JJ – his fourth race! Read more here. 13) Run Michigan Cheap – Northville Edition 10K. 4/7/19, Northville, MI. Time: 1:00:20. Read more here. And that brings me to present day! With 13 races under my belt, I’m only 1/3rd of a race away from being 1/3rd done with the challenge! And I have three more races scheduled for April, so I’m definitely on track to finish up by the end of the year. This entry was posted on Wednesday, April 10th, 2019 at 8:27 pm and is filed under Uncategorized. You can follow any responses to this entry through the RSS 2.0 feed. You can leave a response, or trackback from your own site. 4 Responses to I’m Nearly 1/3rd Done With My Year-Long #40years40races Challenge! Definitely ahead of schedule. As of your last race, the year is only 26.5% over, but you’ve completed 32.5% of your goal. Nice going David. I hope to complete another race with you this year, if I’m lucky enough! And if I’m lucky enough!